The legal authority to impose taxes in New Jersey is derived from the 1947 State Constitution and implementing laws codified in Title 54 of the New Jersey Statutes Annotated (hereafter N.J.S.A. available online at the Rutgers School of Law). The collection of state taxes is the responsibility of the Department of the Treasury, primarily through its Division of Taxation (tax filing, processing and collection) and its Division of Revenue and Enterprise Services (business registration and tax payment services). For most of its history, the state lacked a statewide general tax, relying largely on revenues from railroad taxes and fees, a variety of business levies and sales of state property such as tidelands. In the nineteenth century, the state's efforts to avoid taxing its residents resulted in its being derided as the "state of the Camden and Amboy" for the corrupt influence of the dominant railroad monopoly on state government; toward the end of the nineteenth century, New Jersey was branded as the "traitor state" for its weak corporate regulation intended to attract trusts and monopolies to establish their legal domiciles in the state in return for fees which again allowed the state government to avoid taxing its own citizens. It was not until the 1950s that the state enacted a sales tax--its first statewide tax on the general public. 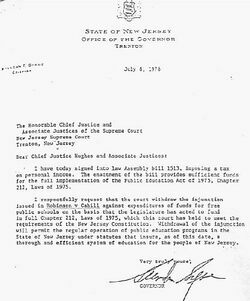 After failed attempts in the 1960s by both Governor Hughes and Governor Cahill, the state became one of the last to enact an income tax, which was signed by Governor Byrne in 1976. The income tax was approved only after the state Supreme Court ordered the closing of public schools, placing intense pressure on the legislature to force passage of the tax. Even after the additional revenues provided by the income tax, New Jersey local governments remain heavily dependent, compared to most states, in financing schools and local government operations on their taxation of real estate, first commenced in 1670 during the colonial period. New Jersey completed the phaseout of its estate tax in 2018 and reduced its sales tax rate from 6.875% to 6.625%, completing a two-year revision which also imposed higher gas tax rates. At the same time, however, a new individual income tax bracket with a rate of 10.75% was created, the third-highest in the country, along with a corporate income tax surcharge on companies with income of $1 million or more, raising their tax rate to 11.5%. According to the report published in January 2019 by the nonprofit Tax Foundation based in Washington, D.C., the most recent national state tax burden comparisons (for fiscal year 2012) showed New Jersey with the third highest tax burden with 12.2% of income required to pay state and local taxes, behind New York (12.7%) and Connecticut (12.6%). The lowest burdens were for Alaska (6.5%), South Dakota (7.1%) and Wyoming (7.1%). The national average for all states was $4,420 per capita and 9.9% of total income. Of all state and local tax revenue, New Jersey collected 48.1% of its total tax revenues from the local property tax, the highest percentage of all states and compared to the national average of 32.1%. The state also ranked highest of all states in property tax collections per capita at $2,924, more than twice the average for all states of $1,427. In 2014, according to data from the State Department of Community Affairs, property taxes in the state averaged $8,161 per home, a 2.2% increase over the level of the previous year. In 2012, the US Census Bureau reported that total New Jersey state and local government revenue, including taxes, federal aid, licenses and fees, was $91.9 billion, with the state government accounting for about $57.6 billion and county and local governments $47 billion of the total. On all federal taxes, the Internal Revenue Service reported that in fiscal year 2014 New Jersey corporate and individual taxpayers paid over $134.8 billion, the sixth highest total of all states, ranking behind only California, Texas, New York, Florida and Illinois. New Jersey consistently ranks as one of the states with the lowest return of funds from the federal government compared to federal taxes paid by state taxpayers; in 2015, the personal finance Web site WalletHub ranked New Jersey the state least dependent upon federal government aid overall and having the fourth lowest return from the federal government compared to federal taxes paid from the state, receiving only 48 cents per tax dollar paid. The state personal income tax was enacted in 1976 during the administration of Governor Brendan Byrne, with its revenues dedicated by constitutional amendment to support public schools and to provide property tax relief. The tax was approved only after earlier income tax proposals by Governors William Cahill and Richard Hughes failed to pass in the legislature. 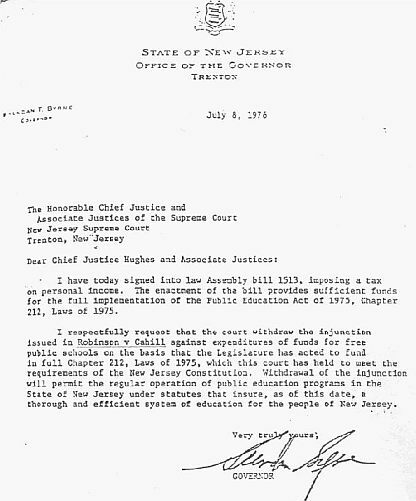 The 1976 legislation gained passage after the New Jersey Supreme Court, in its Robinson v. Cahill decision, held that the state's system of relying on the local property tax as the primary revenue source for financing public education was in conflict with the state government's responsibility under the 1947 Constitution to provide a "thorough and efficient" education for all students. After the legislature failed to enact an adequate school funding source within the deadlines set by the decision, the Court ordered all schools closed commencing on July 1, 1976, subsequently vacating the order on July 8 after the legislature passed and Governor Byrne signed legislation establishing the tax. The dedicated revenues from the income tax, estimated to be about $14 billion in the fiscal 2016 budget, now account for approximately 40% of all state government revenues. Income taxes from residents are based on six or seven brackets, depending upon filing status. 1.4% on the first $20,000 of taxable income. 1.75% on taxable income between $20,001 and $35,000. 3.5% on taxable income between $35,001 and $40,000. 5.525% on taxable income between $40,001 and $75,000. 6.37% on taxable income between $75,001 and $500,000. 8.97 percent on taxable income of more than $500,000. 1.75% on taxable income between $20,001 and $50,000. 2.45% on taxable income between $50,001 and $70,000. 3.5% on taxable income between $70,001 and $80,000. 5.525% on taxable income between $80,001 and $150,000. 6.37% on taxable income between $150,001 and $500,000. 8.97% on taxable income of more than $500,000. New Jersey annual tax returns are due April 15 or the next business day if that date falls on a weekend or holiday. In 2018, according to data from the state Department of Community Affairs analyzed by NJ1015.com, New Jersey's average residential property tax bill was $8,767, an increase of $77, or 0.9% from the prior year. In all, $28.3 billion was collected by local governments through property taxes in New Jersey in 2017. Based on the annual report of the Washington, D.C.-based Tax Foundation, in 2019 New Jersey ranked third, behind Connecticut and Indiana, in its property tax burden. The highest average property tax bills in 2018, according to an article published in February 2019 by NJ.com, were reported in Millburn ($24,308); Alpine ($21,299); Tenafly ($20,717); Rumson ($20,602); and Mountain Lakes ($20,471). Total property taxes billed statewide by local governments were a combined $27.1 billion, an increase of $610 million over the previous year and twice the level in 2000 of $13.5 billion. In recent years, school taxes have accounted for slightly over half of the total property tax bill. On average, municipalities spend 55% of their revenues on schools, with the remainder going to such expenses as police, public works and administration. All real property located in the state is subject to property tax on the basis of its market value unless specifically exempted by statute. Exemptions include property owned by the state and local government and public authorities, as well as property dedicated to qualified religious, charitable, educational and healthcare uses. Limited exemptions or abatements are also provided to developments in designated urban renewal projects authorized by municipal governing bodies. Qualified farmland is taxed based upon its productive capabilities when actively devoted to agricultural or horticultural uses. The assessed valuation of real property is based on 100% of its fair market value, which is defined as what a willing, knowledgeable buyer would pay a willing, knowledgeable seller on the open market at a bona fide sale as of the statutory October 1 pretax year assessment date. The tax on the property is then calculated by multiplying the general tax rate by the assessed value of the particular property. Real property taxes are assessed and collected by the assessors and collectors of the respective municipalities but are subject to supervision and review by the county boards of taxation. Assessments may be appealed by taxpayers to the board of taxation in each county, and a judgment of the tax board may be further appealed to the Tax Court of New Jersey. County, municipal and school budget costs determine the amount of property tax to be paid. A municipality's general tax rate is calculated by dividing the total dollar amount it needs to raise to meet its share of the county budget and it own budget expenses by the total assessed value of all its taxable property. Property tax payments are due annually in four installments payable on February 1, May 1, August 1 and November 1. Effective in the 2018 tax year, as part of a broad overhaul of the federal tax code enacted by President Donald Trump and the Republican Congress, the federal deduction for state and local taxes (known as "SALT"), will prohibit homeowners from deducting more than $10,000 in property taxes and state income taxes from their federal taxable income. In reaction to the federal cap, the state’s own deduction limit for property taxes was increased by state lawmakers to $15,000. New Jersey has also joined with other high-tax states in a federal lawsuit seeking to have the new federal SALT cap declared unconstitutional. Effective January 1, 2018, the New Jersey Sales and Use Tax Rate was lowered to 6.625% from the prior rate of 6.825%. All retail sales are taxable unless specifically exempt by law. Current exemptions include most food items for at-home preparation, prescription medications, clothing (except fur items), footwear, utility charges such as for electricity, gas, water, steam and fuel, and disposable paper products such as toilet paper for use in the home. The state also has established 32 Urban Enterprise Zones covering sections within 37 economically distressed cities in which retailers who are annually approved by the local Urban Enterprise Authority are allowed to charge half the regular tax rate, and also have the right to purchase items (excluding motor vehicles) and most services without paying sales taxes on their purchases. Apart from the sales tax, a compensating use tax is also imposed when taxable goods and services are purchased, including items bought on the Internet, and New Jersey sales tax is either not collected or is collected at a rate less than New Jersey's sales tax rate. The Alcoholic Beverage Tax Act imposes taxes on alcoholic beverages, in addition to the regular sales tax, at a rate of $5.50 per gallon for hard liquor; $0.875 per gallon for wine; and $0.12 per gallon for beer. The Alcoholic Beverage Tax is paid by manufacturers, wholesalers and other persons licensed by the Division of Alcoholic Beverage Control. Retail licenses are authorized and issued by municipalities of New Jersey. A tax is imposed on the sale, use or possession for sale or use within New Jersey of all cigarettes. As of 2015, the tax rate is $2.70 per pack, the ninth highest rate among all states. License fees are payable by distributors, wholesalers, manufacturers, retailers and vending machine retailers. A separate Tobacco Products Wholesale Sales and Use Tax is imposed on sales of all tobacco products (excluding cigarettes as defined in N.J.S.A 54:40A-2) by a wholesaler or distributor. Effective in October 2016, New Jersey's motor fuels tax was increased by 23 cents per gallon, going from 14.5 cents to 37.5 cents per gallon. The tax applies to sales of gasoline, diesel fuel or liquefied petroleum gas and compressed natural gas used in motor vehicles on public highways. A separate Motor Fuels Use Tax (N.J.S.A. 54:39A-1 et seq.) imposes a fuel use tax on certain commercial and omnibus vehicles based on the amount of motor fuels used in their operations within New Jersey and is administered by the New Jersey Division of Motor Vehicles. For decedents dying prior to the effective dates of the statute phasing out the estate tax, estates with assets of $675,000 or more were taxed at rates commencing at 37% on the first $52,174 over the exemption with lower rates on larger estates ranging from 4.8% to 16%. The Corporation Business Tax Act imposes a franchise tax on a domestic corporation for the privilege of existing as a corporation under New Jersey law, and on a foreign corporation for the privilege of having or exercising its corporate charter in the state or doing business, employing or owning capital or property, maintaining an office, deriving receipts, or engaging in contracts in New Jersey. The tax applies to all domestic corporations and all foreign corporations having a taxable status unless specifically exempt. The tax also applies to joint-stock companies or associations, business trusts, limited partnership associations, financial business corporations, and banking corporations, including national banks. Also, a corporation is defined as any other entity classified as a corporation for federal income tax purposes and any state or federally chartered building and loan association or savings and loan association. For C Corporations with Entire Net Income greater than $100,000, the tax rate is 9% (.09) on adjusted entire net income or such portion thereof as may be allocable to New Jersey. For taxpayers with Entire Net Income greater than $50,000 and less than or equal to $100,000, the tax rate is 7.5% (.075) on adjusted entire net income or such portion thereof as may be allocable to New Jersey. Tax periods of less than 12 months qualify for the 7.5% rate if the prorated entire net income does not exceed $8,333 per month. For taxpayers with Entire Net Income of $50,000 or less, the tax rate is 6.5% (.065) on adjusted net income or such portion thereof as may be allocable to New Jersey. For S Corporations with total entire net income that is not subject to federal income taxation or such portion thereof as may be allocable to New Jersey, there shall be no rate of tax imposed. For taxpayers with total entire net income plus nonoperational income with New Jersey Nexus, greater than $50,000 and less than or equal to $100,000, the applicable tax rate for entire net income that is subject to federal corporate taxation is 7.50% (.075). Tax periods of less than 12 months qualify for this reduced rate if the prorated amount of entire net income plus nonoperational income with New Jersey Nexus does not exceed $8,333 per month. For taxpayers with total entire net income plus nonoperational income with New Jersey Nexus of $50,000 or less, the tax rate for entire net income that is subject to federal corporate taxation is 6.5% (.065).Tax periods of less than 12 months qualify for the 6.5% rate if the prorated if the prorated amount of entire net income plus nonoperational income with New Jersey Nexus does not exceed $4,166 per month. Banking and financial corporations are subject to the Corporation Business Tax Act at the rate of 9% on net income or to the lesser rates stated above if their income meets those thresholds. In addition to the above taxes, New Jersey also imposes various taxes for special purposes. These include the Spill Compensation and Control Act (N.J.S.A. 58:10-23.11 et seq.) imposed upon the transfer by major facilities or vessels of petroleum products and other hazardous substances within New Jersey, as determined by the New Jersey Department of Environmental Protection; Petroleum Products Gross Receipts Tax on the gross receipts derived or gallons sold from the first sale of imported petroleum products made to points in New Jersey for sale or consumption within New Jersey; Tobacco Products Wholesale Sales and Use Tax is imposed on sales of all tobacco products (excluding cigarettes as defined in N.J.S.A 54:40A-2) by a wholesaler or distributor; Solid Waste Services Tax (N.J.S.A. 13:1E-138a) levied on the owner or operator of every sanitary landfill facility in New Jersey on all solid waste accepted in a landfill; Landfill Closure and Contingency Tax (N.J.S.A. 13:1E-100 et seq. )is levied upon the owner or operator of every sanitary landfill facility located in New Jersey on all solid waste accepted for disposal; Litter Control Tax (N.J.S.A 13:1E-99.1) on all gross receipts from wholesale sales and on all gross receipts from retail sales of litter-generating products sold within or into New Jersey by each person engaged in business in the State as a manufacturer, wholesaler, distributor or retailer of such products. A Rutgers-Eagleton Poll taken in November 2017 reported that just 17% of New Jerseyans felt they received their money’s worth for the state and local taxes they pay, with a margin of 64% to 6% responding that they got a worse rather than better deal than taxpayers in other states. The opinions were generally consistent with those expressed in surveys over the past 40 years. In 1972, before the passage of the state income tax in 1976, 73% of respondents said they paid too much in taxes for services, with the most positive margins reported in 1984, when 64% saying they did not get their money’s worth while 29% believing they paid the right amount. According to the 2012 poll, voters also recognized New Jersey as a high tax state, with 85% saying they believed they paid more than other states, compared to only 10% who so responded in 1972, before the income tax was enacted. By 1984, the belief that New Jersey taxes were higher than other states had risen to above 50%, a proportion which continued to steadily increase in subsequent years.